There are many reasons that I love my “job” as pastor. Of course, as I begin this article I think of the old quote by Confucius… “Choose a job you love, and you will never have to work a day in your life.” I completely agree with this quote whether you are in pastoral ministry or in business or in whatever you do, if you love it, it will not feel like work. 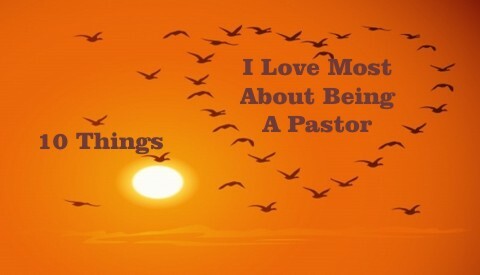 Here 10 things I love most about being a pastor. It is great to be used by God in your vocation. I love the fact that by being a pastor, I can embrace the gifts and talents that God has given me and use them for His glory everyday. This is closely related with the first reason but I wanted to give it its own category. God has given all believers at least one spiritual gift (many believers have more than one gift I believe) and He expects us to use these gifts not for our own enjoyment but for the glory of His Son as we use our gifts to encourage and build the body of Christ to take the gospel to every nation. When we use our gifts we are in a place that God wants us to be. No one has every gift and when we realize that, we will start to understand that we all need to use our giftedness and embrace each other in the body of Christ. I truly am energized when I see believers utilize their spiritual gifts. This is one reasons that really energizes me as pastor. When I get to see people use their gifts for God’s glory, it is such a blessing to me. As pastors, we are to be shepherds which I believe is not only in protecting the flock but in getting people ready to be used by God. This is a great joy watching others receive and accept the good news of the gospel of Jesus Christ. There is nothing better than seeing a new birth (both physical birth and spiritual birth) and knowing that this new believer will be with the Lord forever and ever. There are many moments in life that are just what I will call significant or important. We often think of these moments as joyous events but in this category I say significant or important as life moments that are not always joy filled moments. Being with someone when they have lost a loved one or when they get hard news (maybe something like a cancer diagnosis) is when you often are able to be used by God and it will often create a bond with that person that will last and last. These moments can be happy moments too but when they arise, and you are there for someone, you feel like the instrument of God that He intends us to be. Setting your own schedule is a nice benefit of this job. It is sad that some pastors abuse this privilege and don’t always do the things that need to be done but if you are motivated and disciplined, it is nice to be able to structure your time in ways that make you the most profitable. I am an early morning person so I like to get an early start but there are some that are not that way and may want to start later. Being a pastor usually gives you this opportunity. There are weeks that you end up starting early, never leaving and staying late…this is part of being a pastor, but it is nice have flexibility to set your own working hours (typically). Being a pastor, you will be preparing to speak often…usually a couple times a week at a minimum. I count it a privilege to study God’s word and be able to tell others about it. If I am open to the leading of the Holy Spirit, I will have whatever passage I am preparing to hit me first (understand that God’s word is for me too and not just the group that I am speaking to) before I try to tell others about it. If I am preparing and think that this sermon is for “them” and not me, it will probably not be for anyone. Several times a week I meet with people who have good reason to be discouraged. Death. Cancer. Sickness. Loss. Betrayal. Hurt. What do my congregants want and need? Encouragement. I am blessed to be God’s messenger of the good news. And, oh yeah… by the way I remember that God’s message of the good news applies to me too! And when I see the trials and hard times that others are going through, it makes me regain perspective and be thankful to God for His goodness. Every day I get to go to the house of the Lord. I know that some days I probably think of my job as just that…a job. But I get to “go to church” (as my 3 year old son says when I leave) every day. That is awesome. I get to talk about God and pray with people and have an office where I have about 20 Bibles and just that many software versions and actually get to do this every day!!! I am blessed. One of my college professors (Professor Tom Allen from Cairn University) often told our class that we need to speak the gospel message to ourselves every day. I think he is so right. We need to be reminded daily that Jesus came and died on a cross for me. That He was buried and rose again to overcome sin and death. I get to be reminded of that every day when I walk in and see the cross in the sanctuary. When I open the Bible and read about it. This truly is a great blessing.